Surface insertion depth (into ground if apparent): As above, but it also looks as though the very bottom part has broken off. Finish (varnish, paint, oiled, unfinished etc): Possibly oiled. 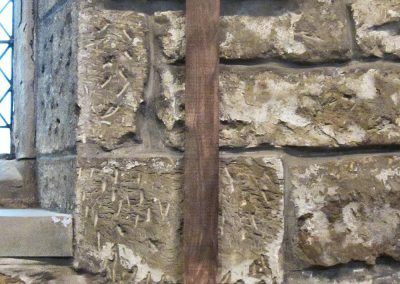 Condition (cracked, paint peeling, woodwork, damage etc): Good apart from some holes where drawing pains have been used to attach poppies. 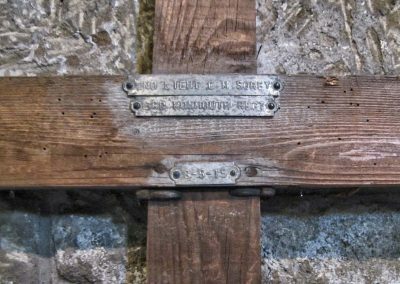 Charles Malin Clifton Sorby was born 23rd February 1895 in Darfield and was the second of the four children of Revd Albert Ernest Sorby (Rector of Darfield) and Lydia Jane Sorby. In the 1901 census, when Charles was aged 6, he was living at Darfield Rectory with his parents and older sister, Annie, aged 9. 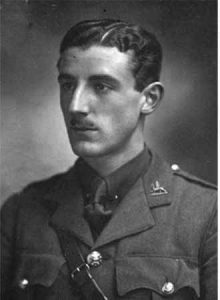 He was educated at Hurst Court, Hastings and then at Cheltenham College, where he was a member of his house football team and cox of his house boat. In the 1911 census, at the age of 16, he was staying with his aunt and uncle, John and Annie Dalzell, in Dulwich, south London. Meanwhile, back in Darfield, he now had two younger brothers, John aged 2 and Robert aged 7 months. 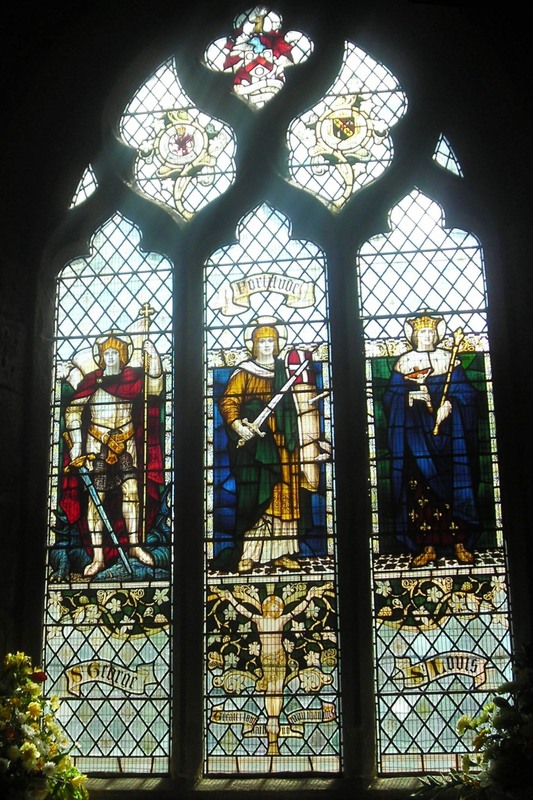 Charles left Cheltenham College and took up engineering and was going in for a course of mining engineering at Ebbw Vale Collieries when war broke out. 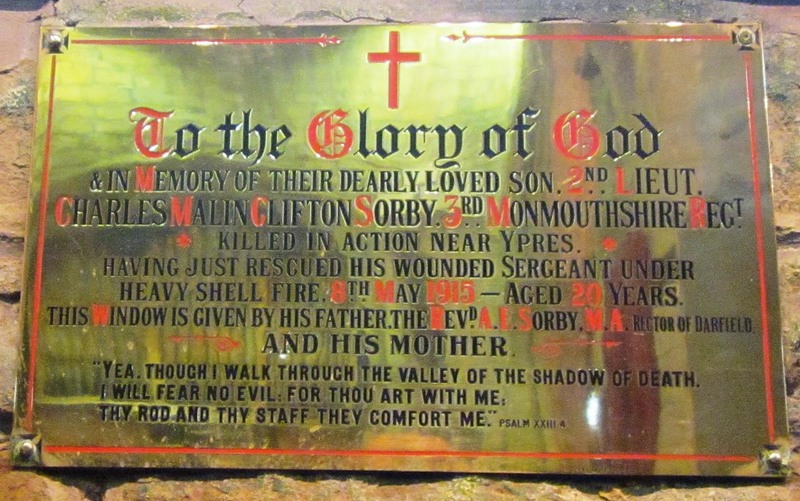 In September 1914 he got his commission in the 3rd Monmouthshire Regiment at the age of 19 and went to the front in February 1915. 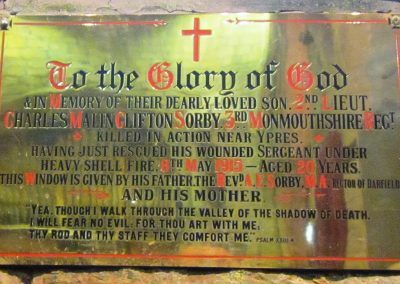 In early May 1915 the 3rd Monmouthshires fought in the Battle of Frezenberg Ridge, which was part of the Second Battle of Ypres. 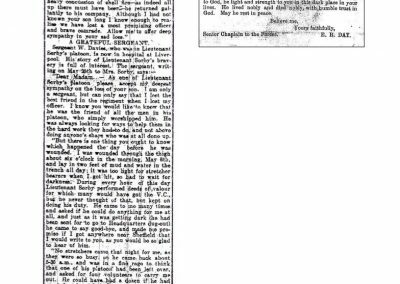 A detailed description of Charles’ last day and the way in which he received the wounds from which he died is given in a letter from a Sergeant W Davies of his platoon. 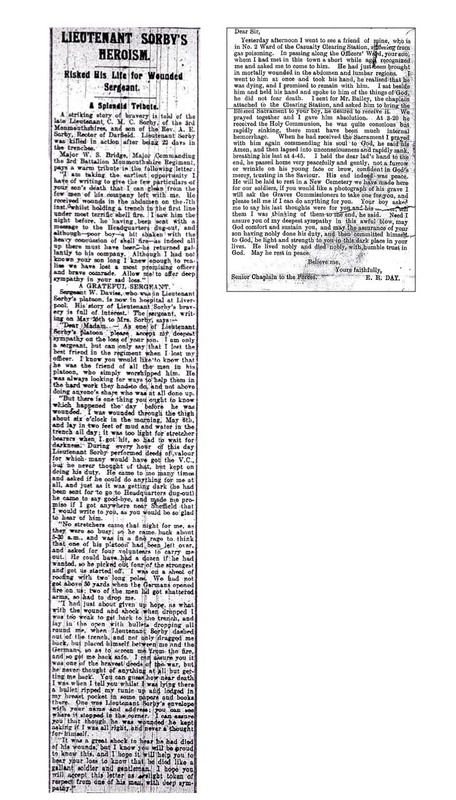 The letter was published in the Barnsley Chronicle and the Mexborough and Swinton Times of 29th May 1915 . 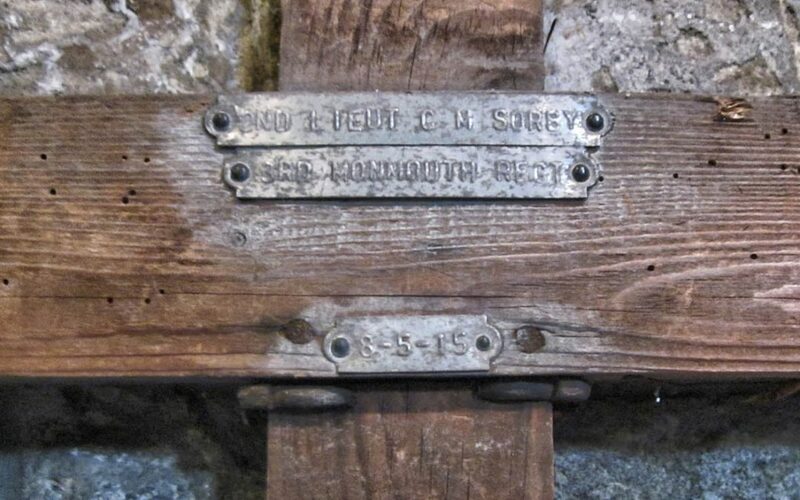 Charles Sorby died in the casualty clearing station on 8th May 1915 from wounds received to his abdomen and back. 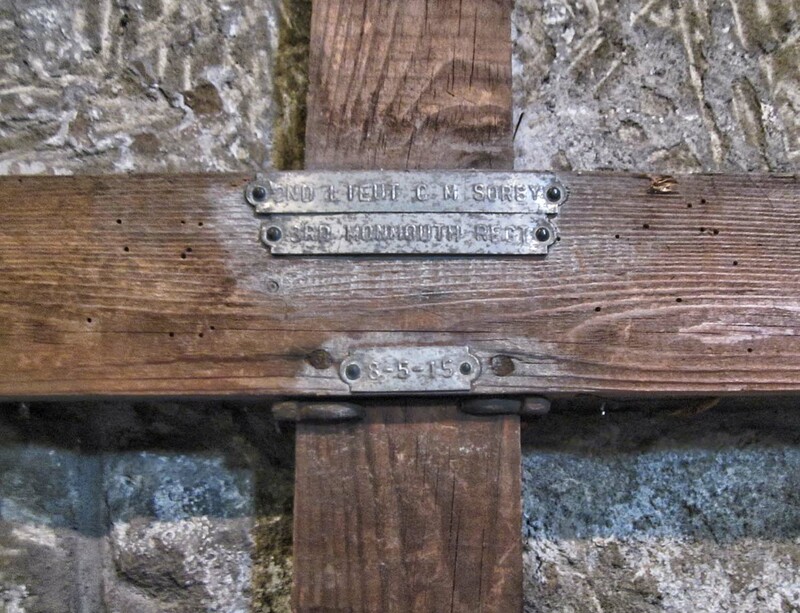 He was buried at Bailleul Communal Cemetery, which is 14½ miles southwest of Ypres. 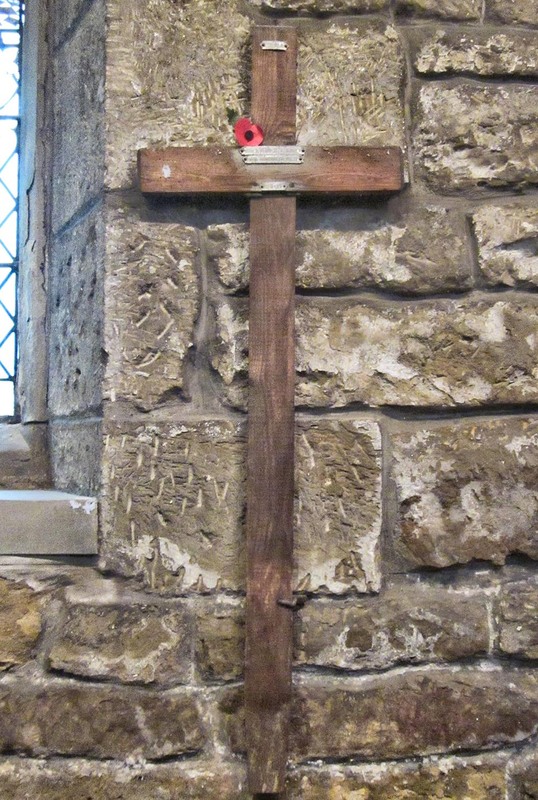 The wooden cross from his war grave was brought back to Darfield All Saints and still hangs on the wall there, close to a window in his memory, as noted on a brass plaque, donated by his parents and dedicated 3rd June 1916 (see chapter two of this book). Charles was awarded the 1914-15 Star as well as the Victory and British War medals. 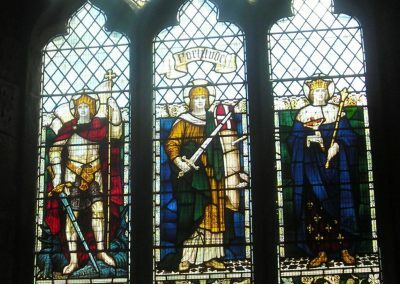 His name is also included on the Sheffield City Council and University of Sheffield Rolls of Honour and the Cheltenham College Roll of Honour. Survey and photographs courtesy of Kay Valentine and Sheila McMillan, Additional info Patricia Shooter and David Hildred.